Capsules compatible with Nescafe® Dolce Gusto® available at MaxiCoffee are selected based on two simple ideas : combining the best in cup result while ensuring the complete compatibility with your Nescafe® Dolce Gusto® machine. Choose among our selection of capsules compatible with Nescafe® Dolce Gusto®, at the best prices : coffee drinks, cappuccino/latte, chocolatey drinks, etc... There is something for everyone! These capsules compatible with Nescafe® Dolce Gusto® represent a beautiful alternative to capsules already on the market. Introductory offer of 96 Nescafe Dolce Gusto capsules - 6 varieties. Perfect for a gentle awakening! For a creamy macchiato ! Hot chocolate ideal for kids! Selection pack - 80 x Dolce Gusto® compatible capsules. Selection pack - 50 x Dolce Gusto® compatible capsules. 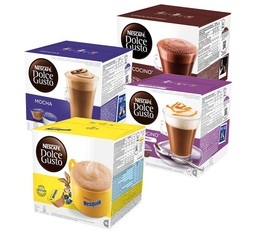 Selection pack - 80 x Dolce Gusto® compatible Café Royal capsules. Selection pack - 100 x Dolce Gusto® compatible capsules. 10 x Dolce Gusto® compatible Intenso capsules. 10 x Dolce Gusto® compatible Hot Chocolate capsules. 16 x Dolce Gusto® compatible Oquendo Mepiachi Cappuccino capsules (2 x 8). Try this box of 16 Oquendo Mepiachi Cappuccino capsules, compatible with all Dolce Gusto® system machines. 16 x Dolce Gusto® compatible Oquendo Mepiachi Caffe Latte capsules (lactose-free). Selection pack - 40 x Dolce Gusto® compatible capsules. Dolce Gusto® compatible cappuccino capsules. 10 x Dolce Gusto® compatible Forte capsules. 10 x Dolce Gusto® compatible Classico capsules. 10 x Dolce Gusto® compatible Ginseng capsules. 100 x Dolce Gusto® compatible Classico capsules. Perfect for preparing: cappuccino, latte macchiato, etc. 10 x Dolce Gusto® compatible English Breakfast tea capsules. 10 x Dolce Gusto® compatible Camomile capsules. 10 x Dolce Gusto® compatible Barley (Orzo) capsules. 10 x Dolce Gusto® compatible Earl Grey Green Tea capsules. 16 x Dolce Gusto® compatible Café Royal Caffé Grande capsules. 16 x Dolce Gusto® compatible Café Royal Kids chocolate capsules. 16 x Dolce Gusto® compatible Café Royal Decaffeinated capsules. 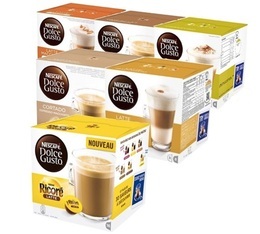 16 x Dolce Gusto® compatible Café Royal Cappuccino capsules (makes 8 drinks). 16 x Dolce Gusto® compatible Café Royal Colombia capsules. 16 x Dolce Gusto® compatible Café Royal Espresso Forte capsules.